"Move over Zatarain's® this is healthier and tastier." Heat oil in a large skillet over medium heat; cook and stir sausage until browned, about 5 minutes. Add onion to sausage; cook and stir until slightly browned, about 5 minutes. Stir sweet pepper, oregano, thyme, cayenne pepper, celery salt, and red pepper flakes into sausage mixture; cook and stir until fragrant, 1 to 2 minutes. 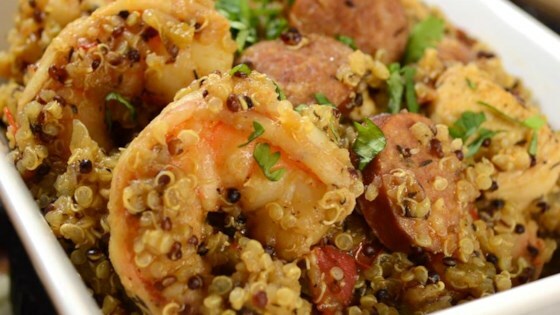 Mix quinoa into sausage mixture; cook and stir until quinoa is slightly toasted, about 1 minute. Pour broth and marinara sauce over quinoa mixture. Cover skillet and simmer until quinoa is tender, about 15 minutes. See how simple it is to make rich and hearty Creole jambalaya. Feel free to add shrimp, diced chicken, or sub in extra veggies. Add more or less cayenne for your heat preference, or drizzle with Sriracha for a real kick in the pants. Really tasty! I made it with half boneless skinless chicken thights and half kielbasa. Easy and very tasty. I used a smoked chicken kielbasa and added celery, a red pepper, and some chopped spinach.